Unus (Latin for the number one) was an ambitious Austrian carpenter named Franz Furtner who had a flair for gymnastics. After a while, he discovered he could make more money performing, and by the end of the 1930s he was one of the biggest circus stars in Europe. He performed before a fascinated Hitler. Unus had one sensational trick, never duplicated -- he stood on one finger. In tails, white tie, and top hat, he balanced his entire body (never removing the hat) on the forefinger of his right hand. After the war, Ringling brought him to the U.S., where he was a star attraction until 1960. His fame was enormous. He appeared on the cover of Life and was praised in print by Hemingway. 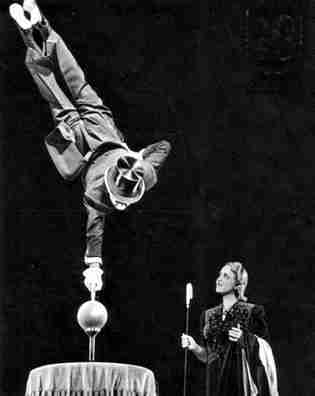 On Junuary 06 1989 Franz Furtner Unu was inducted into the Sarasota's Circus Ring of Fame.